All laws and regulations related to an Alabama driver license and non driver identification cards are administered by the Alabama Department Of Public Safety. To view State Department of Public Safety office locations and operating hours click here. The Houston County office is located downtown Dothan on the 1st floor of the Houston County Administration Building at 462 North Oates Street. The hours of operation are 7:00 a.m. to 5:30 p.m. Monday through Thursday. If you have questions regarding services offered, please call 334-677-4742. If you are applying for a new driver license, a learner's license, a new ID card, a motorcycle operator license, or boat operator's license, then you will test with the State DPS driver license examiner. If you are transferring an out-of-state driver license to an Alabama driver license, then you also must receive approval from the State DPS driver license examiner. Supporting document requirements and restrictions for new licenses and identification cards are approved by the Alabama Department of Public Safety. In 2012, DPS developed the STAR ID program to comply with the federal requirements of the REAL-ID Act of 2005. Once the provision of the REAL-ID goes into effect in October, 2020, those persons who do not possess a valid, unexpired US passport will need a STAR ID to board commercial aircraft for domestic flights or to enter certain regulated federal facilities. STAR ID is available to qualified individuals at any State DPS office. To view a list of required documents download here. In 2009, the Alabama Legislature increased the cost of driver licenses and non-driver licenses by 50 cents to add funding for the Veterans Living Legacy Act Citizenship fund. The Alabama Department of Public Safety began a program to allow the scheduling of the road skills test in Dothan at their state office at 5679 Montgomery Hwy. If you would like to schedule by phone, their number is 334-983-5616. If you wish to schedule online, then click here for their link. The written examination and authorization fee is $5.00 per test. The driver license card issuance fee is $36.25. The State DPS office accepts cash and bankcards only. To renew your existing Alabama driver license or to apply for duplicate license that is lost, you may apply in the Houston County License Division. To view list of approved documents click here. (Currently CDL with Hazmat renewals must be completed with the State DPS Office.) The fee for the replacement license is $31.25. To renew the driver license, the fee is $36.25 and your expiration date is extended by four years. Alabama Law allows an additional sixty (60) days to operate your vehicle beyond the listed expiration date on your Alabama license card without citation. It is recommended that you renew your driver license before attempting to board a commercial flight or drive out-of-state, since most officials will not be aware of the sixty (60) day grace period. A driver may renew their license card at any county licensing office in Alabama. Always verify your personal information for accuracy when you renew or replace your driver license. A permanent license card will be mailed from the Alabama Department of Public Safety within thirty days. If you do not receive your license in 30 days, then contact the state agency at 334-242-4400. A nonresident who has a valid driver license from the state of previous residence may drive without an Alabama license for 30 days after becoming a resident of the state. A nonresident at least 16 years old who has in his immediate possession a valid driver license issued to him in his home state or country and is properly enrolled and registered in a school or college in this state may operate a vehicle without an Alabama driver license. Likewise, military personnel from other states and their families stationed in Alabama are not required to obtain an Alabama driver license as long as they hold a valid driver license from their home state or country. If you would like to download the driver license manual, or learn about the documents required by the State DPS Office for new drivers or transferring your out-of-state driver license, then visit the web site at the Drivers License Division, Alabama Department of Public Safety. 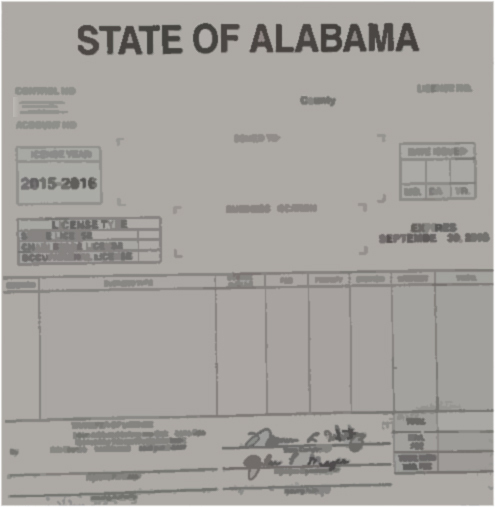 The State of Alabama offers a hardship license. To view all document requirements click here. This license is issued at the State Department of Public Safety.